Dictation Pro is a software that allows us to speech through the microphone and the computer will immediately type the words that we said earlier, even though Pro Dictation software is still beta, but feasible for you to test, Dictation pro software is already equipped with the commands for formatting, delete, and copy a word or passages. 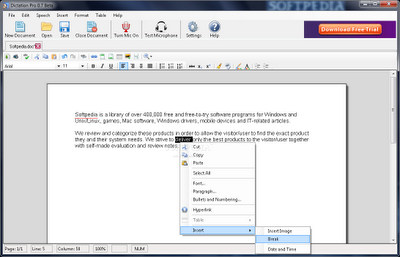 using Pro Dictation software allows you to more quickly complete the office work such as typing, because you will not be bother to type it manually, speech in front of the microphone that is connected to the PC, and Dictation Pro software will automatically typed for you according to the word that comes out of your mouth. layout has a pretty simple interface and allows you to more quickly understand Dictation Pro software, this software can be downloaded free by clicking the download link below.